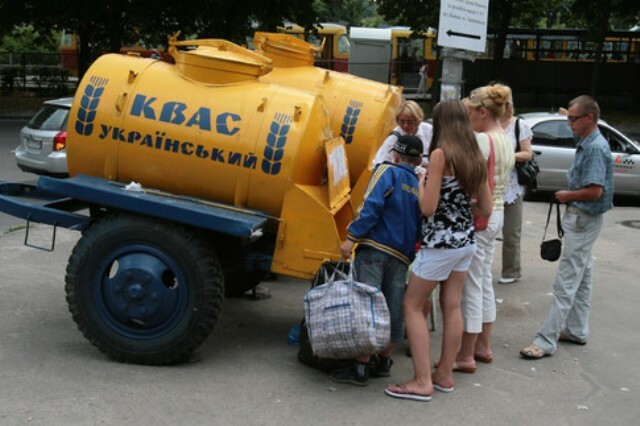 People line up to drink kvass from a tanker cart. Reviews trickled onto the BeerAdvocate website and a peculiar trend slowly emerged. The reviews highlighted the good and bad of the beers, compliments were mixed with criticism and the humored good nature of the local craft beer community was apparent. The one thing that was consistent was the score being posted: perfect. When this happened in June of 2010 the BeerAdvocate “Top 100 Beers on Planet Earth” required a minimum of ten reviews to be listed. The exact formula was weighted in favor of consistent reviews. This means that a very controlled pool of reviews—for instance from a rare kvass that had never been reviewed before—could in effect be catapulted into the Top 100 with as little as a dozen reviews. This is precisely what happened. As soon as eleven reviews came there it was. Just sitting there. Nobody seemed to notice at first, which gave it the chance to climb even higher. A couple days later it was sitting pretty at the #62 Top Beer on Planet Earth. Magnificently, this noble kvass shone brilliantly as a beacon of hope to the other kvasses of the world. Until somebody noticed. It would seem that the site administrators were not as pleased with this elegant kvass as the rest of us. In fact, they appeared to be rather annoyed, if not seething with anger and resentment. And so began The Great Purge. The reviews were buried in a mass grave. A dozen champions of craft beer who bravely reviewed it were exiled to a long and sorrow Siberian winter (or in this case an unseasonably cool Southern California summer). Banned and left for dead, these souls must not be forgotten. Some begged for their account’s freedom. Others spat seething e-mails. After some days and weeks, most were allowed to return. Some were unceremoniously shot in the head, accounts purged permanently. It is said there is one whose account is still intact, but locked and unable to be used. He may be imprisoned in the Gulag indefinitely, but he gracefully and stalwartly refuses to admit that he didn’t like that beer. This article is dedicated to him. Just over a month later, for the first time in years, administrators on BeerAdvocate revamped the formula that determined the Top 100 beers. The initial changes were widely regarded as disastrous, then requiring 1,000 reviews. With extraordinarily few beers having so many reviews, nearly any beer that happened to have a lot of reviews was suddenly a “Top 100” beer, including mediocre beers rated as low as a B+. This was soon revamped to the current number of required reviews: 108. Bobby still refuses to say he did not like that beer. This entry was posted in Features and tagged beeradvocate, feature, kvass, woodshop. Bookmark the permalink. This is a captivating story so far. Kinda makes me feel obliged to tell the story of the infamous Stonekasper/Stonepurist debacle. Keep up the excellent writing.